After failing to enlist in 1916 due to ill health, Roy de Maistre became interested in the treatment of shell-shock patients by putting them in rooms painted in soothing colour combinations. 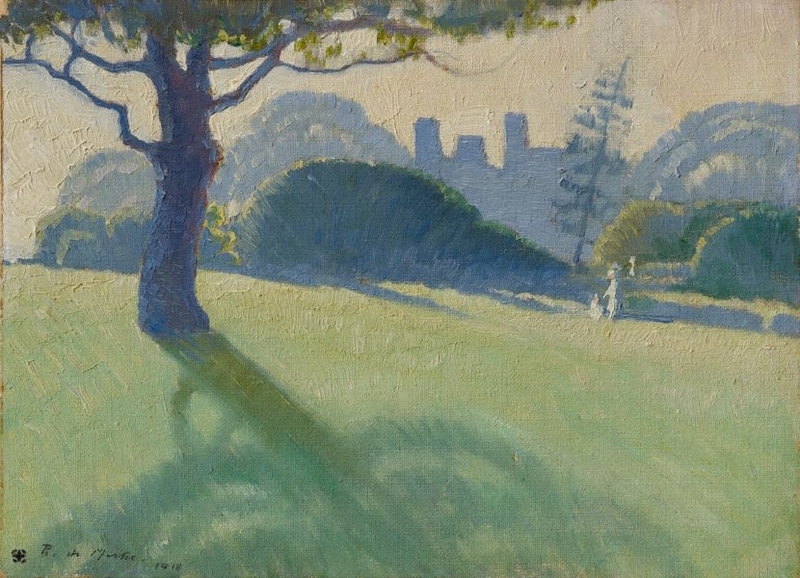 In late 1918, he collaborated with fellow artist Roland Wakelin in exploring the relationship between art and music. Their experiments produced Australia's first abstract paintings, characterised by high-key colour, large areas of flat paint and simplified forms. The works received critical acclaim, but modernist developments were largely derided by the conservative establishment. After 1919 de Maistre virtually abandoned colour-music and abstraction, instead his paintings of 1921–22 experimented with Max Meldrum's theories of tonalism. 'Across the Domain' 1918 reflects the artist's full embrace of modernism, under the guiding influence of his teacher and mentor Antonio Dattilo-Rubbo, who encouraged his exploration of post-Impressionism. Signed and dated l.l. corner, pen and black ink "R. de Maistre 1918".